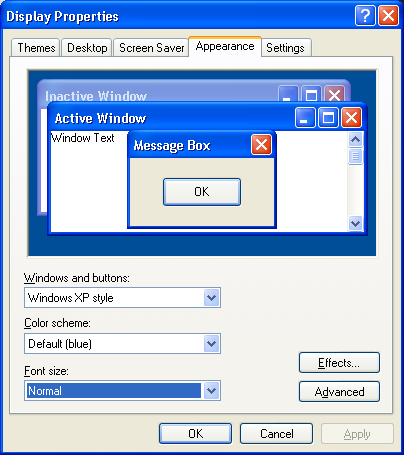 Certain buttons or label displays may appear chopped off or not visible, due to the large font setting for the entire Windows. Right mouse click on the windows desktop, and select the Properties. On the Display Properties pop-up, switch to the Appearance tab. Confirm that the Font size is set to Normal. Change to Normal if not. Close the Vascular Research Tools application and re-launch the same application. Check that the buttons or label displays are showing correctly. On the Display Properties pop-up, switch to the Settings tab, and click on the Advanced button. 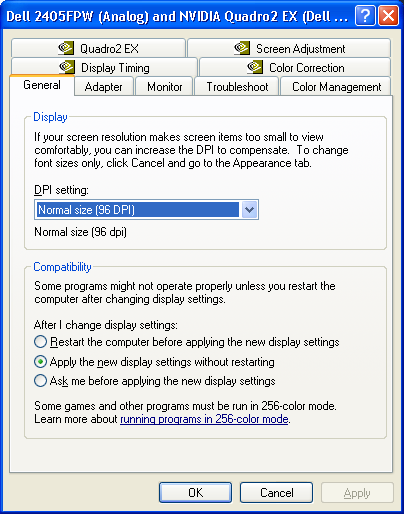 Depending on the brand of the vide graphics card the advanced setting window may be different. Look for the Display DPI setting. Confirm or change the DPI setting to Normal size (96 DPI). An example setting window using the Nvidia video graphics card is shown below. Email is a preferred way for communication with us. We appreciate your feedback. Prompt and detailed supports is provided free of charge. Vascular Tools 5- FDA Approved - clinical assesment of FMD/endothelial function of brachial artery and IMT/intimal-medial thickness of carotid artery from ultrasound image data. Vascular Research Tools 6 - Vascular Tools plus additional modules for carotid plaque analysis, vascular compliance. Includes additional reporting flexibility, well suited for clinical trials. Available as software or as turn-key integrated workstations, for investigational use only.